Join me for some organic island music. 6-9p fun music, ono food and good times see you there tonight. Ultamate UB40 Song in my book, I could make myself cry singing this one. Don't break my Heart. First place you can get it is right here on YouTube and I would love a visit to the web page www.damienawai.com. Born and raised on the Island of Maui Hawaiian Boy Damien Awai Keeping a smile on your face and Aloha in your heart. Ultamate UB40 Song i toku pukapuka, i taea e meinga e ahau e karanga ahau waiata tenei tetahi. Kaua e whakataka hoki i taku Heart. Ko te tika i konei i runga YouTube wahi Tuatahi taea te tiki e koe i te reira, a e aroha ahau he tere ki te whārangi tukutuku www.damienawai.com. I whānau a ara i runga i te moutere o o Maui Hawaii Boy Damien Awai te haapa'oraa i te ataata i runga i tou mata, a Aloha i roto i tou ngakau. Ultamate UB40 노래는 나의 책에서, 나는 나 자신이 하나의 노래를 울게 만들 수 있습니다. 내 마음을 아프게하지 마십시오. 당신이 그것을 얻을 수있는 첫 번째 장소는 바로 여기에 YouTube에서 내가 웹 페이지 www.damienawai.com을 방문 싶어요. 태어나 당신의 마음에있는 당신의 얼굴과 알로하에 미소를 유지 마우이 하와이 소년 데미안 Awai의 섬에 올렸다. Ultamate UB40 Song i boken min, kunne jeg gjøre meg gråte synge denne. Ikke bryte mitt hjerte. Første stedet du kan få det er rett her på YouTube, og jeg ville elske et besøk til websiden www.damienawai.com. Født og oppvokst på øya Maui Hawaiian Boy Damien Awai holde et smil på ansiktet og Aloha i ditt hjerte. Ultamate UB40 Song í bók minni, ég gæti gert mig gráta syngja þetta einn. Ekki brjóta hjarta mitt. Fyrsti staðurinn sem þú getur fengið það hérna á YouTube og ég myndi elska í heimsókn til vefsíðu www.damienawai.com. Fædd og uppalin á eyjunni Maui Hawaii Boy Damien Awai Gæsla bros á andlit þitt og Aloha í hjarta þínu. We all know its so hard to get back into the groove, more so if you hanging from the 4th of July Weekend. I wanted to do another Peter Moon Band Song and this one I love. Play it Once Play it twice... Mahalo for the follow on YouTube click on the links and subscribe please. Here's this weeks music video. This song has kinda turned into a Hawaiian island Classic. i believe this song is written by Eddie Grant 1980's reggae innovator. Hope you like the song and enjoy the video. Mahalo for watching. 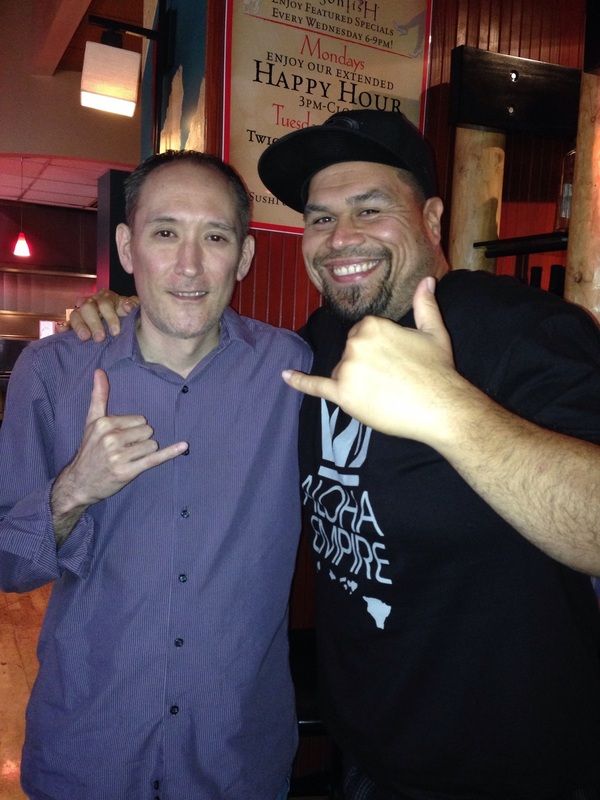 Ok so if you want to see what Hawaii influence has here in Seattle you need to stop by and make time for Wednesday nights at ohana in Belltown on 1st ave.
Big Mahalo to Bruddah Kyle a.k.a "YOSH" And da Yamada boys showing nothing but love, letting us come and share what we do. Big Mahalo! Got to catch up and see Bruddah Steve from PG, Aaron from Sansei back in the day. Steve mahalo for taking me on the drinking tour before the show... That was a great idea! I would like to thank the band although I can't remember anyone's name but bruddah Pak, the guitar player was on point and says he will be on Maui June-July and I gotta tell you I really like his chops! The horn player and guitar locked very tight, Pak is da most awesome host unselfish, happy and willing to step in and help! Energy was positive. Really no down side to last nights show. If you live in Seattle and you love 808 music you missed one high energy ukulele Hawaiian roots funk session. They said I had a hour... I started at about 12am and got off at 2:10am lol dis Hawaiian KAN! Aloha Kakahiaka Seattle Washington! Join us tonight at Ohana's for full night of 808 music, set the night to island vibez! For those of you who follow Big Mahalo for the Love and support. Heres something you might not see or even know about. Heres a taste of whats going on. I hope you like it, we LOVE making it.